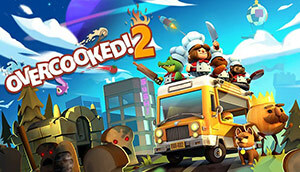 Overcooked 2 drops you and up to three friends into an array of wild and wacky kitchens, desperately racing against the clock to make and serve dishes while a host of hazards — especially your own lack of teamwork — conspire against you. 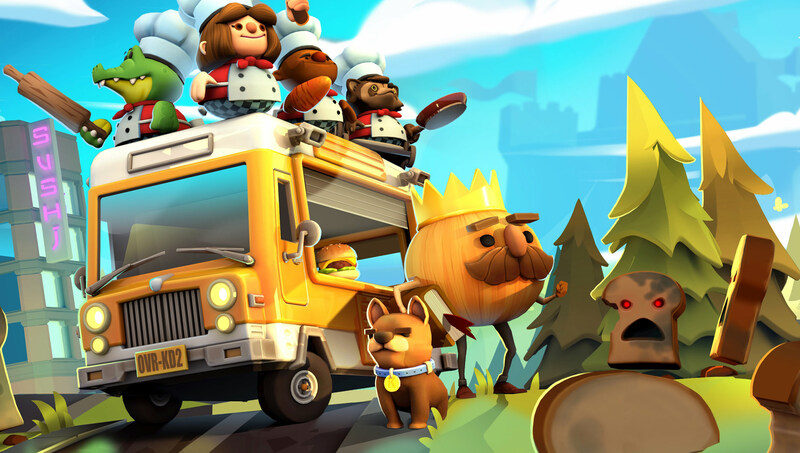 In principle, Overcooked 2 sounds deceptively simple: work together to chop, mix and cook various ingredients to build and serve the requested dishes. In reality though, this soon gets completely out of control, in a delightfully fun way. 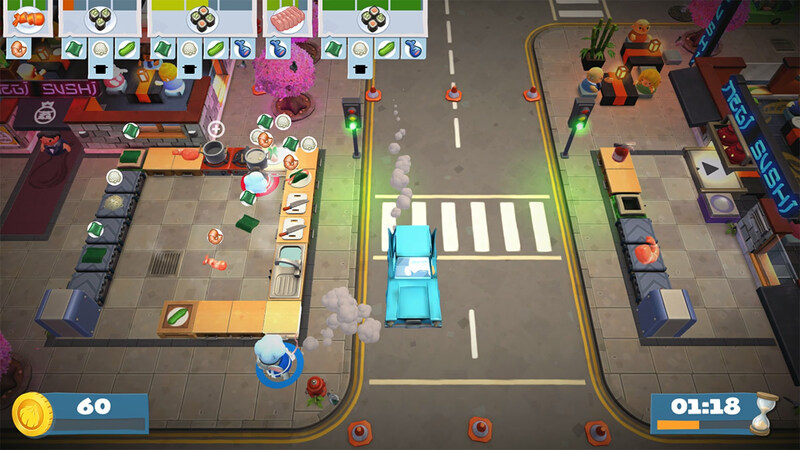 Overcooked 2 plays in a single screen top-down perspective, with up to four players dashing around kitchens to fetch, prepare and serve meals, and just like its predecessor the game is misleadingly simple looking. Every level has its own options for what dishes will be asked of you, and the game will very quickly test how well you and your fellow chefs can work together. The hallmark of Overcooked is giggle-inducing insanity, and this sequel dials it up even further, challenging new chefs and veterans alike. You’ll only have a few minutes per level, and each order that comes in won’t hang around for long, so you’ll need to work together intelligently to prepare each dish in time; perhaps delegating one chef to grabbing and chopping raw ingredients, a second to cooking and frying, and a third to assemble the final orders, serve them, and wash up dirty dishes. While this sounds very simple on paper, in game things break down very quickly. Communication between players soon deteriorates from task delegation to yelling at people to get out of the way, panic setting in as unattended cooking pots threaten to catch fire and orders signalling their imminent failure. The best laid plans soon fall apart as the levels take control, with parts of your kitchen being swept out of reach or being completely rearranged. You’ll watch helplessly as your finest effort of planning ahead of time where everyone needs to be goes horribly wrong, and you can’t help but laugh. The game is a master at gently overloading your senses, ensuring each level becomes a chaotic mess as you wrestle with juggling every task required — you’ll need to chop and prepare ingredients while keeping an eye on anything currently cooking, making sure dishes are assembled correctly, glancing at the current orders, wondering where the cheese is, why aren’t there any clean plates for serving, and so forth. Levels have their own themes and hazards which complicate the cooking process and require some deft thinking on who goes where. Kitchens on rivers or hot air balloons often have parts of their kitchens moving around at all times, while magical schools have disappearing stairs and portals to teleport around with. Sometimes parts of the map will move around from time to time, and occasionally you’ll be stranded apart from each other, looking on helplessly as you wait for a chance to pass a completed dish to your partner to serve; a few levels even completely transition during gameplay, such as a kitchen suspended by crane which ends up swept along a rushing river thanks to a flood. 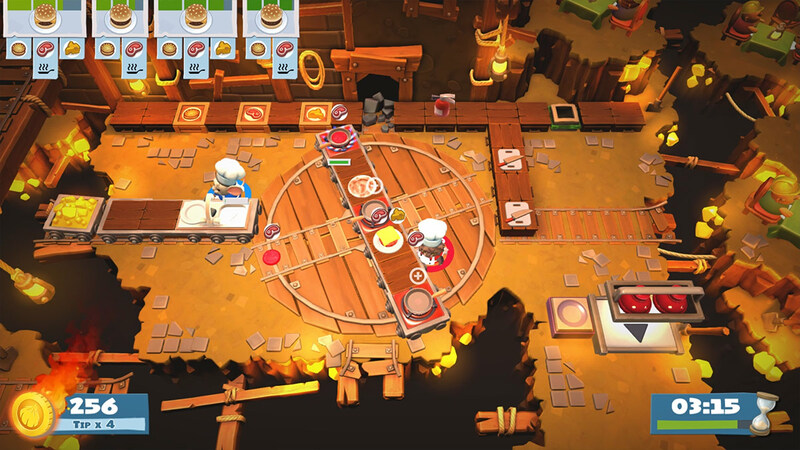 To combat the wild dynamics, Overcooked 2 introduces a throw mechanic, where players can now toss raw and chopped ingredients around. Good use of throwing ingredients to one another soon becomes an essential skill to pick up, as the levels make full use of your new enhanced ability by walling off players from each other or encouraging you to fling ingredients around before conveyor belts carry them off to a nearby trashcan. 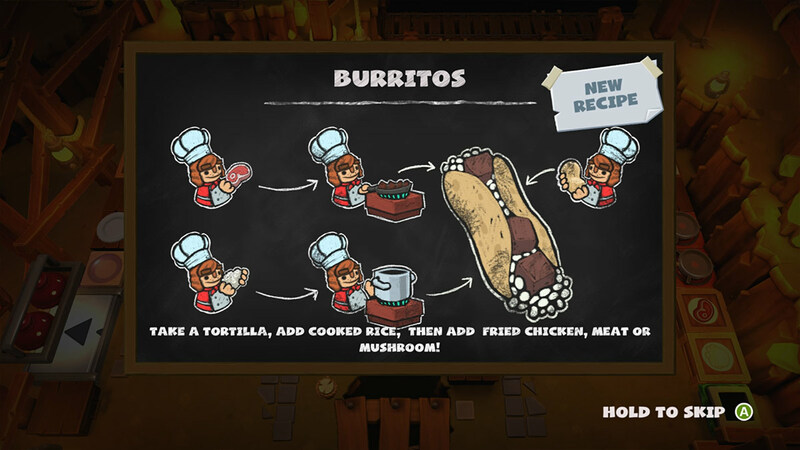 Recipes in Overcooked 2 are a little more complex than the first game, and a couple of these stumped us as the instructions aren’t always conveyed clearly. We butted heads against one particular level several times as we couldn’t tell why our breaded meat wasn’t working, until I figured out that we needed to add meat to the breadcrumbs and then add additional breadcrumbs before it could be cooked. Seems logical in hindsight, but no other recipe has worked like that — it’s always been one of each item — and the game doesn’t give any kind of indication that it’s the way to go. Luckily, issues like this are few and far between.